SAES developed a range of technologies enabling the deposition of pure metals and alloys on several kinds of substrates. 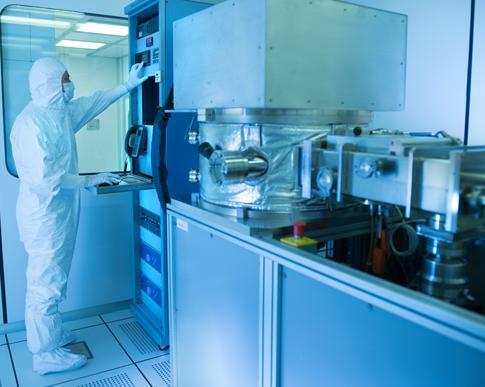 Sputtering is normally used to deposit high surface area getter alloys onto silicon wafers, used by the vacuum MEMS industry as cap wafers, to create and maintain a well-defined gas composition inside MEMS cavities. Also, sophisticated sputtering facilities were developed to coat with non-evaporable getter alloys the inner walls of vacuum chambers of particle accelerators and synchrotron radiation sources. Very thin layers of pure metals (such as palladium) may also be deposited onto metal substrates (such as titanium) to provide the energy storage industry with advanced hydrogen getter systems. Being PVD a vacuum technique, SAES takes advantage of its huge knowledge of Vacuum Science and Technology to properly simulate the deposition processes, according to vacuum gas dynamics theoretical models and to cold plasmas modeling, to modify vacuum deposition equipment so that process control and optimization can be properly achieved and to characterize the chemical, morphological and functional properties of thin film systems.